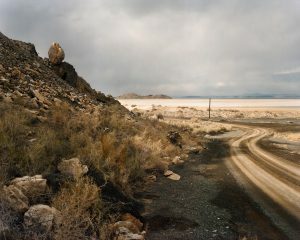 The Salt Effect is a phrase that I first heard while photographing in northwestern Utah, a region of great beauty and harsh conditions. It was meant as a play off the term “The Lake Effect,” which describes the odor of Great Salt Lake as the wind blows southward–a sulfur-like smell that ironically transforms a breathtaking place into one where it can be unpleasant to take a simple breath. The Salt Effect aptly describes my immersion and experience in the weather of the high desert surrounding Great Salt Lake. Centrally located in the middle of nowhere is a fascinating and melancholy intersection of the natural and built worlds. In this region of Utah, historical events have left faint but indelible marks. Two of the largest engineering efforts of the 19th and 20th century took place here. In 1869 the completion of the transcontinental railroad was memorialized with the Golden Spike, and during WWII the Wendover army air force base trained and housed the Enola Gay crew before fueling and heading to Hiroshima. Such fateful acts are still visible in the landscape. Responsive to the challenges of the weather and terrain, I work with more than one photographic process; the resulting pictures speak to ironies in the relationship between people and their environment. Whether observing land use in Utah as a document of what has already occurred or as a premonition of future devastation, my photographs explore the impact of culture on nature and vice versa.